At SMX Advanced I added a new line to my conference resume: Q&A moderator. The session was iConvert: Landing Pages & Conversion In A Smartphone & Tablet World and presenters explained the challenges to business in an age of mobile browsing growth. They spoke to the web development solutions available for delivering optimal mobile experiences. 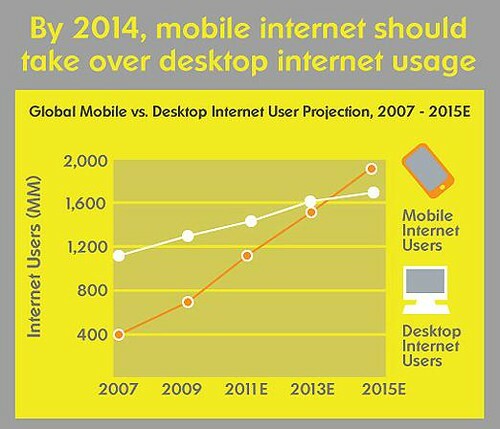 By 2014, mobile internet usage will overtake desktop internet usage. Half of local searches are performed on mobile devices. More than a quarter of mobile phones in the world are smartphones. When Facebook and Google developers plan new features and products, they think of the mobile experience before the desktop experience. In other words, if the mobile user experience is poor no one expects users to stick around. I spoke to Carlos del Rio, @inflatemouse, director of conversion analysis and digital strategy at Unbounce Marketing Solutions, and a presenter at the SMX Advanced iConvert session for his business case for a mobile web strategy. In his presentation Carlos explained that the top hindrance to mobile conversions is speed; just 1 second of load time can drop conversion by 7%. Google and Bing have recently declared recommendations for responsive design for the web development and SEO communities to take note. At SMX Advanced, Google rep Pierre Farr was on the panel for iSEO: Doing Mobile SEO Right, where he shared Google’s “Recommendations for building smartphone-optimized websites“. Pierre offered up solutions for device-specific HTML and dynamically serving content based on user-agent detection for those unable to implement the recommended solution of responsive design. Google Developers resources for Building Smartphone-Optimized Websites goes into greater detail of implementation requirements. Like other solutions for mobile content delivery, there are drawbacks to responsive web design, including loading time as unnecessary content is called, lacking cross-browser compatibility, and problems with image size.